As a part of a major initiative by NSTIR to twin Highway 104 through the town of Antigonish, HEC received the contract to design six major structures along the new alignment. Working in an Integrated Team approach, HEC provided preliminary designs of various options for each structure, worked with environmental / regulatory, survey, geotechnical and highway alignment design team members and provided final designs with tender ready documents with unit items, quantities and special provisions for all structures. Further, where required, HEC participated in consultations with various interest groups including the Highway 104 Citizens Liaison Committee and Paqtnkek Mi’kmaq First Nations. 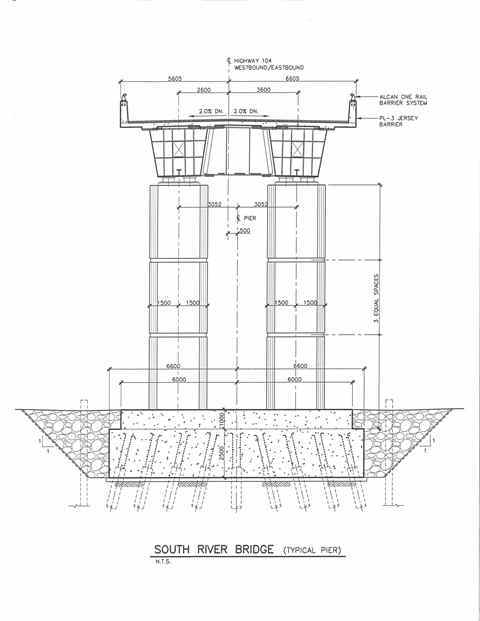 South River Bridges: The two new structures crossing the South River are long multi-span, continuous, twin, trapezoidal steel box girders with a hybrid, semi-integral/expansion joint abutment design and in-water piers founded on piles socketed into rock. With total spans of 309 m for the Eastbound structure and 328 m for the Westbound structure, the South River Bridges represent the longest girder spans in the province and carry a combined capital investment of nearly $30 M. Each structure consists of four continuous spans with exterior spans of 71.5 m and interior spans of 92.5 m (Westbound structure) and 83 m (Eastbound structure). Due to the potential of Karst conditions in the soluble gypsum bedrock, an innovative socketed pile system was developed by HEC, in conjunction with the project geotechnical engineer to support the piers and abutments. Presently, HEC is also involved in several aspects of the construction of the South River Bridges for the contractor and steel fabricator. HEC has completed the designs of the temporary pier cofferdams, and are currently undertaking the design of a precast, post-tensioned alternate deck system for each bridge, and the box girder erection. The innovative girder erection method involves the use of a launch nose and a temporary cable stayed / tower system mounted to each girder to facilitate the launch of the structure across spans as long as 92.5 m without the need for expensive cranes or temporary bents to limit the length of the leading cantilever. Dunn’s Loop Underpass: The new structure is a two equal span, continuous, twin trapezoidal steel box girders on a horizontal curve, with semi-integral abutments founded on piles socketed into rock. The total structure span is 146.5 m. MSE walls were incorporated into the design to minimize spans and provide the grade separation between the existing trunk highway and the new highway. Due to similar conditions witnessed at South River, the potential of Karst conditions in the soluble gypsum bedrock required the use of an innovative socketed pile system that was developed by HEC, in conjunction with the project geotechnical engineer to support the piers and abutments. Taylor Road Underpass: The new structure is a two span, semi-continuous, prestressed concrete girder bridge with semi-integral abutments founded on steel H piles and a central hammer head type reinforced concrete pier supported on a spread footing founded directly on bedrock. NEBT 1800 concrete girders were used to achieve the total span of 70 m (35m-35m). The alignment featured a relatively tight horizontal curvature that was accommodated by using tangent girders and variable overhangs in the two 35 meter spans. South Side Harbour Road Underpass: The new structure is a two span, semi-continuous, prestressed concrete girder bridge with fully-integral abutments founded on steel H piles and a central hammer head type reinforced concrete pier supported on a pile cap and H piles driven to refusal in the underlying bedrock. NEBT 1800 concrete girders were used to achieve a total span of 70 m (35m-35m). Major Culvert at 8+150: The new structure is a cast-in-place concrete rigid frame with a mat foundation spanning 12 m over a small watercourse. The mat foundation was designed to deal with soluble bedrock conditions to mitigate the chance of sink holes in the bearing influence area during the service life of the structure. The structure extends between the east and west bound lanes and is continuous across the median for a total length of 52 m. The open cross section dimension of the structure was set to allow a trail on both sides of the watercourse and to allow a specific amount of daylight and head room so as to encourage the passage of moose and other animals below the highway.